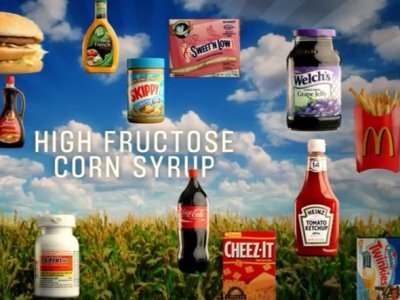 Let's talk about High Corn Fructose Syrup (HCFS). HCFS was first introduced in Japan in the 1970's. From then it was quickly introduced into our food supply as they were very affordable. So cheap that it has made its way into almost all processed and packaged food we see. HCFS contains glucose and fructose components similar to sugar but through enzyme processing, the glucose is converted into fructose. A closer look at the labels in packaged food will reveal that they contain almost no fiber, the important factor needed to counteract the negative consequences of consuming fructose. Without many of us realizing, we eat way too much of HCFS as they are found in almost everything we see including soft drinks, breakfast cereals, bread, yogurt, salad dressings, pizza sauce, bbq sauce, ketchups, fruit drinks, canned fruits and even cough syrup. We used to eat much less fructose from whole fruits and vegetables before HCFS existed and today an average adolescent consumes a lot more sugar than before, making one in four person obese. Why is HCFS so bad? - It does not have any nutritional value. - It is corn-based and most corn is genetically modified. - It is sugar (fructose) and too much consumption leads to many diseases including obesity, diabetes, and liver problems. - It puts you at a risk for mercury exposure. As for me, I grew up loving ketchups. I dip my fries in it, eat burgers, pizza and pasta with it, and I cook stir-frys with it. Ah, ketchups. I guess I will have to limit my ketchup consumption, or find an organic version that doesn't contain funny stuff. I will also take a closer look into ingredient labels when I buy food. Maybe I may not be able to fully eliminate it, just because HCFS is everywhere, including bread and even burger buns (yes, you read it right!). But at least I will try my best to avoid it as best as I can. What processed foods or drinks that are hard for you to let go?